Rollover Mini Bites are a semi moist liver treat that is perfect for training purposes or as a regular treat. 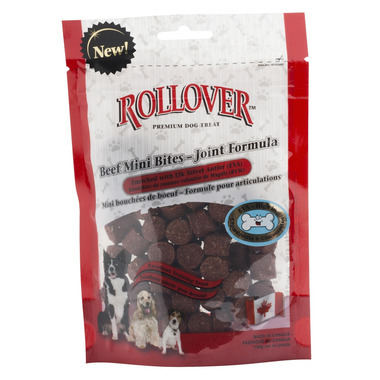 ​Rollover Beef Mini Bites with EVA for Dogs is composed of naturally occurring elements including Chondroitin, Glucosaminoglycan and many others. EVA (Elk Velvet Anter) has been associated with less swelling of the joints and a decrease of stiffness pain, better circulation, faster healing times for wounds breaks as well as healthier skin coat. Ingredients: Pork liver, de-germinated corn meal, canola meal, wheat bran, vegetable glycerin, pork fat, sucrose, corn starch, mustard, elk velvet antler (EVA), organic sea kelp, beef flavor, ground flax seed, phosphoric acid, garlic, sea salt, iron oxide, potassium sorbate, calcium propionate, citric acid. Fat boy loves them. Made in Canada. Love being able to trust a treat. I always trust rollover brand for good, nutritious dog snacks. Our best friend deserves it and he loves, loves, loves rollover treats.